Every time someone asks me about my muse, I lie. (If you write fiction for a living, is it really lying?) I tell some people it is my two rescue dogs Taco and Sancho or I blame my weirdness on my peculiar rescue cats. There are days these aren’t lies exactly, but they’re not entirely the truth. Today I’m finally coming out with the truth, as best I can figure this out. 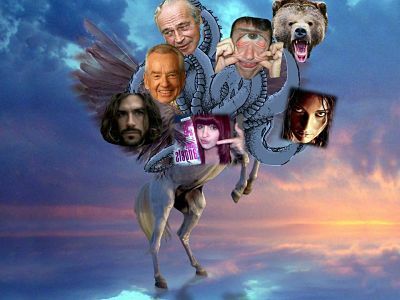 My muse is a seven headed hydra with a flying horse body. There, I said it. And it looks something like this. The flying horse comes from my love of anything HORSE. That love turned me onto reading as a kid in elementary school. I read every book in my school library that had a horse in it. I love westerns, but my favorite horse book was a fantasy with a flying one. I actually worked to buy my first horse and ended up with my family owning several. Noble creatures. The first good-looking hunk (head) on the left is actor Eric Etebari who played the dark assassin, Ian Nottingham, in the short run TV show on TNT, Witchblade. I became so enthralled with his character of a noble assassin that I wrote fanfiction on the show for six months. When the show got cancelled, I could have shriveled up and forgotten about my writing, but it was the best thing that could have happened to me, as I look back. I made up my mind to write original stories after that. Next to Ian Nottingham is Zig Ziglar, motivational speaker who flipped a light bulb over my head when he said that he wrote his non-fiction book doing it a page a day. I thought, “Hell, I could do that” and made up my mind to try. Zig isn’t a motivational speaker for nothing. Next to Zig is Robert Ludlum (RIP), the master of espionage thrillers who wrote the Jason Bourne series and many other great spy novels. He amazed me with his style and pace. Even as a reader, he struck me with his amazing talent and still does when I replenish my writer’s soul by rereading books of his from my personal library. He made me a crime fiction author for life. The Cyclops dude represents my crazy family. It takes a village to raise a writer and I was no exception. I still call my mom everyday and read her what I write in its raw form. My siblings are all very supportive. And my husband is my number one fan, but not in a creepy way like Kathy Bates and he axe. (In the book Misery by Stephen King, she used a turkey carving knife. Read it and you will never see Thanksgiving the same way again.) My husband clears the way so I can focus on my work every day and is my brainstorming partner when I need a level head. The Grizzly bear is my memory of Alaska where I lived for ten years. My heart is still there. Whenever I get lonely for it, I contact friends I have who still live there, but I can also write about it. My books EVIL WITHOUT A FACE and ON A DARK WING are set in Alaska. The dangerous looking woman on the right is my love for strong empowered women in the books I write. Even when these women have incredible emotional baggage, like my bounty hunter Jessica Beckett in my Sweet Justice series, they find a way to survive and thrive. Creating the right man to deserve them is a bonus. But perhaps the most important muse is the one who reminds me why I started writing in the first place. The central woman with a book in her hand is YOU. With every book I write, I start a circle (my journey), but that journey is only half complete. It takes a reader to take that trip with me and complete the circle. Hearing from my readers, especially in the wee hours of the morning via email, can absolutely lift me to a higher place. No lie. So as you can see, I am surrounded by my muse every day and it’s a seven-headed winged horse Hydra. Did you really think my muse was a puppy? Pffftt. Wiggly puppy tails and the smiley faces of my rescue dogs feed another (no less important) part of my soul, but my writing muse is a beautiful magnificent beast. What about you? Do you have a hydra of influences in your closet…maybe wearing a jet pack? HarperCollins launched Jordan Dane’s suspense novels back to back in 2008 after the 3-book series sold in auction. Ripped from the headlines, Jordan’s gritty plots weave a tapestry of vivid settings, intrigue, and dark humor. 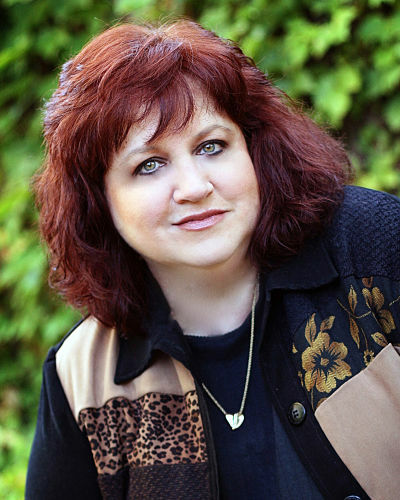 Publishers Weekly compared her intense thrillers to Lisa Jackson, Lisa Gardner, and Tami Hoag. This national best selling, critically acclaimed author’s debut novel NO ONE HEARD HER SCREAM was named Publishers Weekly Best Books of 2008. Dane writes her Sweet Justice adult thriller series for HarperCollins. Her young adult novels, IN THE ARMS OF STONE ANGELS and ON A DARK WING, are with Harlequin Teen. Currently, she is writing a new series for Harlequin Teen – THE HUNTED – slated for release in 2012-2013. Formerly an energy sales manager, she now writes full time. Jordan and her husband share their Texas residence with two cats of highborn lineage and two very lucky rescue dogs. ~ by Monette Michaels on September 19, 2012. Thanks so much for hosting me on your great blog, Moni. Looking forward to meeting you at Bouchercon in Oct.